Few settings rival the Berkshires as a location for an introductory Overland summer adventure camp. Gentle hills become mountains and clear rivers flow past old farms and through postcard-perfect New England towns. With a wide range of fun outdoor activities—from hiking and exploring to camping and rafting—Berkshire Adventure is a great place to start for our youngest campers. As with every Overland trip, Berkshire Adventure offers a supportive, wholesome setting and two caring leaders. Every day, the focus is on having fun and making friends—this is the kind of summer adventure camp experience you are going to want to come back to year after year. A week of adventure and fun in the beautiful Berkshires. Come explore with us! Nestled in the northwest corner of Massachusetts, the Berkshires offer an inviting landscape of hills and mountains, rivers and lakes. Across the region, small towns dot the countryside, offering a look into a quieter, slower, simpler way of life. On Berkshire Adventure, the activities—hiking, camping, rafting and playing games—are all carefully calibrated to suit our youngest campers. 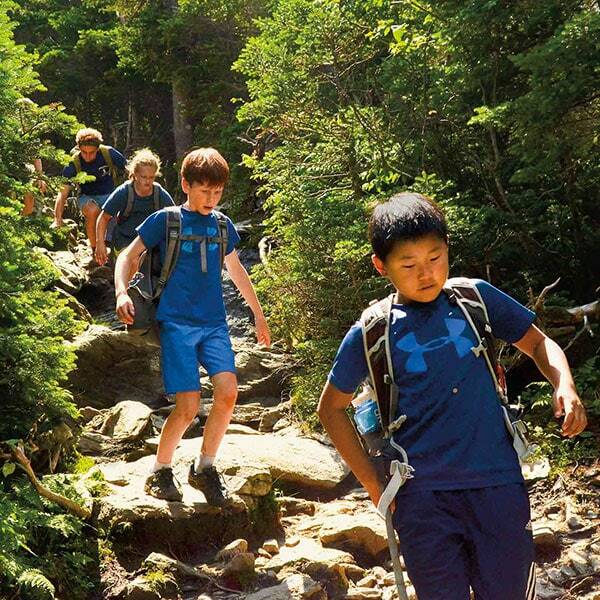 At every step of the way, Berkshire Adventure offers appropriate challenges in a supportive and nurturing environment with Overland leaders who are attuned to the needs of this age group. For many of the campers on Berkshire Adventure, this is their first time having an experience like this, and we are focused on building confidence and independence during their time with Overland. We’ll begin with easier hikes and walks, building up to our hike of Mount Greylock, the highest point in Massachusetts. We’ll also enjoy a day of rafting on the Deerfield River. At trip end, we’ll celebrate all we have accomplished on Berkshire Adventure—a great week of camp and the perfect introduction to Overland. Berkshire Adventure was our very first introductory trip. It’s a great place to start for 4th and 5th graders: a week that’s just adventurous enough with a carefully chosen slate of outdoor activities. This all happens with caring leaders providing excellent supervision to a small group of kids. The activities are fun, and the tone is always warm and welcoming, positive and enthusiastic. Berkshire Adventure has always been a great success for us—and it can be for your child, too. It was Sam’s first time at sleepaway camp, and Overland was a great introduction. He wants to do another trip! The trip begins in Williamstown, Massachusetts. During our first afternoon together, we’ll focus on getting to know one another through games and a short, beautiful hike. On our first full day, we’ll hike in the rolling hills, just north of Williamstown. We will hike up a gradual peak with views of Mount Greylock and the Taconic Crest, which divides Massachusetts and New York. Between hikes, we’ll enjoy the area, swim in a local swimming hole and play group games. On Wednesday, we’ll learn about the land and natural history of the area on a hike guided by the Williamstown Rural Lands Foundation. Next, we’ll start our two-day ascent up Mount Greylock, Massachusetts’ highest peak at 3,491 feet. We’ll carry layers, lunch and snacks in our day packs, and Overland staff will meet us at our campground (halfway up the mountain) with our remaining gear for the night (sleeping bags, tents, cooking gear and food). The next morning, we’ll continue hiking to the summit of Mount Greylock. At the top, we’ll celebrate our accomplishment with a group photo and spectacular views of New York, Vermont, New Hampshire and Massachusetts. To finish our week of fun and exploration in the Berkshires, we’ll raft the Deerfield River with professional guides. The Zoar Gap, a spectacular section of the Deerfield River, is a great balance of fun rapids (class II and III) and calmer water. On our last night together, we’ll celebrate our accomplishments and new friends with dinner on the town. 5 nights of frontcountry camping. Campground facilities will vary and may include flush toilets, hot water, showers and laundry. 1 night of primitive camping while hiking Mount Greylock. We will have access to a composting toilet. What is the weather like on Berkshire Adventure? Hike and raft in the Berkshires of Massachusetts.